Product dimensions:20.69 i. deep, 26.98 in. tall, 28.57 in. wide. 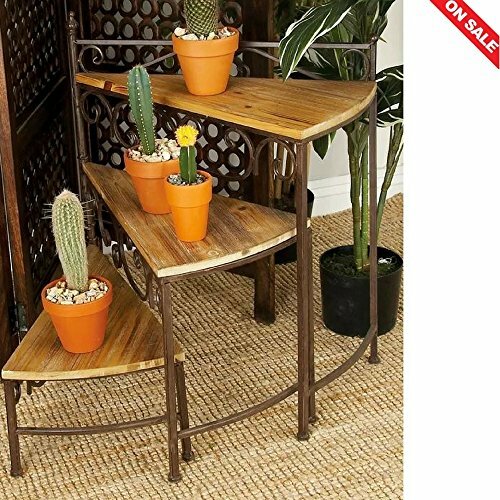 Metal Tiered Plant Stand is a Beautiful Decorated Pot Rack for your Garden or your indoor Plants,Bringing the Best out of Style and Practicality. The Classic Minimal Design along with the Elevated Storage Space will Provide you with Many Decoration Ideas in your Garden or Yard and will Stant Many Years of Use. The Beautiful Design will Make it the Perfect Indoor Decoration Protecting your Sensitive Plants to an Enclosure Environment. Get a Sculpture that will Give you Storage Solutions and will Take care of your Favorite and Sensitive Plants,Making it the Perfect tool for The Job.